Bombshell Proof Soros Funds The Caravans | The Fringe | Conspiracy, News, Politics, and Fun Forum! Bombshell Proof Soros Funds The Caravans | The Fringe | Conspiracy, News, Politics, and Fun Forum! Bombshell Proof Soros Funds The Caravans The-Fringe | Your #1 Source For Conspiracy, News, Politics, and Fun! , , Apache54, Aquarius, bigD111, Deplorably Nameless, Frigg, LucyBarnable, SugarLips, unclelunatic, Verity, WNC likes this! , , Apache54, bigD111, Frigg, SugarLips, WNC likes this! 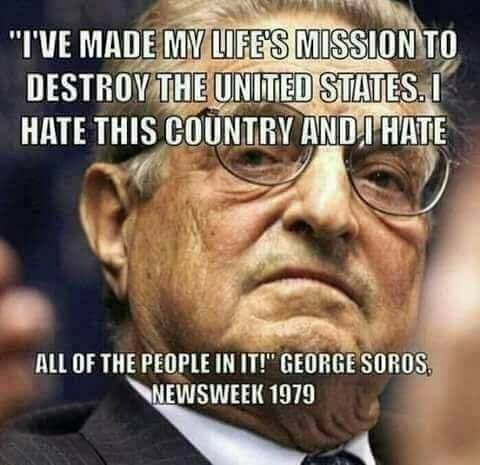 I wish Trump would have Soros investigated and imprisoned for terrorist activities against the USA. But that won't happen. 90% of congress works for Soros. , Apache54, Aquarius, bigD111, Frigg, LucyBarnable, unclelunatic, WNC likes this! (11-08-2018, 05:38 PM)Guest Wrote: Yes. Apache54, Aquarius, Frigg, Verity likes this! Aquarius, bigD111, Dr Evil, phxsparks, Verity, WNC likes this! This I like!!!!! Proof of Soros fuckery!! Aquarius, LucyBarnable, WNC likes this! (11-08-2018, 09:13 PM)LucyBarnable Wrote: Is anyone really surprised by this? Aquarius, Dr Evil, LucyBarnable, WNC likes this! And notice how he doesn't mind who knows it. Aquarius, LucyBarnable, phxsparks, WNC likes this!